Experience the fun of playing the ukulele in this workshop designed for brand-new players. Learn the basics of strumming and playing chords and start making music! No previous musical experience required. This lesson will cover the materials and songs from Part One of my book, Let’s Play! The Ukulele Handbook for Beginners (no book purchase is required). 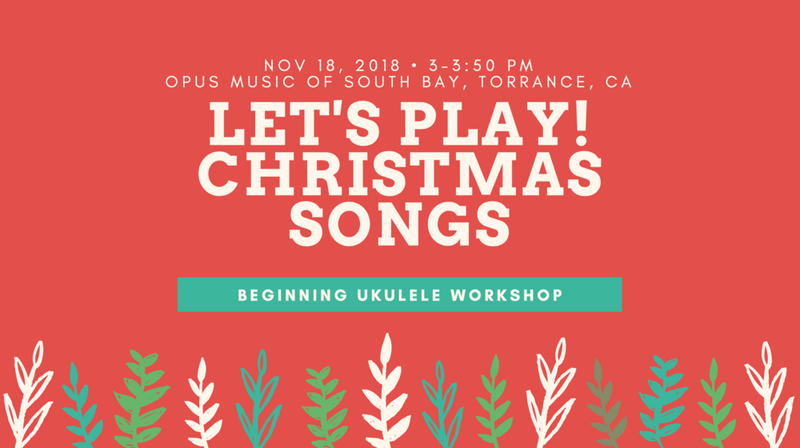 Get your uke ready for the holidays with this fun and festive workshop. We'll strum and sing several beginner-friendly Christmas songs so you can make merry and fa-la-la all season long! Prior to the workshop, I will email you a PDF of all the songs we’ll play. No uke? No problem! If you click on the Register Now button, you’ll also be able to pre-order a starter ukulele kit, which includes everything you need to get started: a soprano ukulele, a digital tuner, a gig bag, a strap, and a copy of my book! Have a question about either workshop? Ask away in the comments. Black Friday Sale: Receive 30% Off My Ukulele Handbook!